"How can I upload photos from iPhoto to my Flickr account on my Mac?" There are several ways you can upload photos to Flickr from iPhoto, although several of them are convoluted. One way is to export photos from iPhoto to a folder on your Mac and then use the Flickr upload page to individually select each photo. Flickr recommends a $15 utility to automate the process, but you don't need to pay anything. There is a great free way to upload photos to Flickr automatically without ever leaving iPhoto. After installing FFXporter, you may need to restart iPhoto in order to use it. 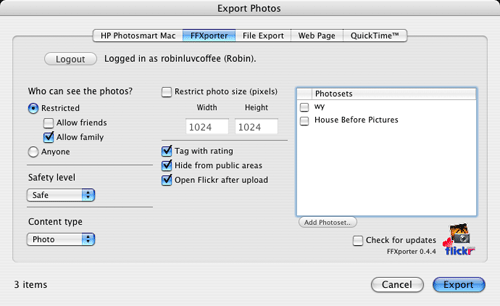 Select some images in iPhoto, then choose File > Export from the menu. Choose the FFXporter tab. The first time you use FFXporter it will take you to a page on Flickr.com where you will approve it for use with our Flickr account. After that you can just sign in when you export files. From the FFXporter menu, you can set preferences for the group of photos you are uploading and create a photo set if you need a new one. After exporting is complete, FFXporter can take you to your Flickr account where you can modify details about your photos or share them with more of your Flickr friends.